People know about Robinson’s (real name Stephen Yaxley-Lennon) EDL and PEGIDA connections but there is a lot more going on behind the scenes about this man. Tommy Robinson used to work at Luton airport but ended up losing his job there following a bit of a “tussle” with an off duty policeman (for that please read that he gave him a beating) when the officer was intervened in a domestic assault between Yaxley-Lennon and his then girlfriend. Robinson was sent to prison for 12 months following that and could no longer be employed at the airport as employees needed a clean conviction history when security was tightened after 9/11. In 2004 Robinson joined the BNP and claims (in an interview with Andrew Neil) that he was not aware that the group was “white only” and says that he ended up leaving because of that fact. In 2009, the English Defence League was started as an evolution of the “United Peoples of Luton” (UPL). This responded to what they decreed the threat of Islamic extremism in the country and various gangs, both football supporting and other elements, decided that “something must be done”. Robinson adopted the alias Tommy Robinson around this time, which was the name of one of the members of the Men In Gear football hooligan gangs who support his local team Luton Town FC. He led the EDL from inception and his cousin Kevin Carroll acted as his deputy. Right from the start, Robinson said that the EDL was just against radical Islam however even from the start the group included bigots who are against all Muslims/Islamic individuals. While not a political group, the EDL did form an association – the British Freedom Party – (an associate of the British National Party) and people could become a member and stand in elections. Following the shootings by Anders Brevik on the 22nd a July 2011, there was a spotlight thrown over the EDL, including Tommy Robinson due to alleged links between Robinson and Brevik. Any links have always been denied by Robinson. Later in 2012, he created the European Defence League which expanded its remit to being against “Radical Islam in the U.K.” to “Radical Islam in Europe”. 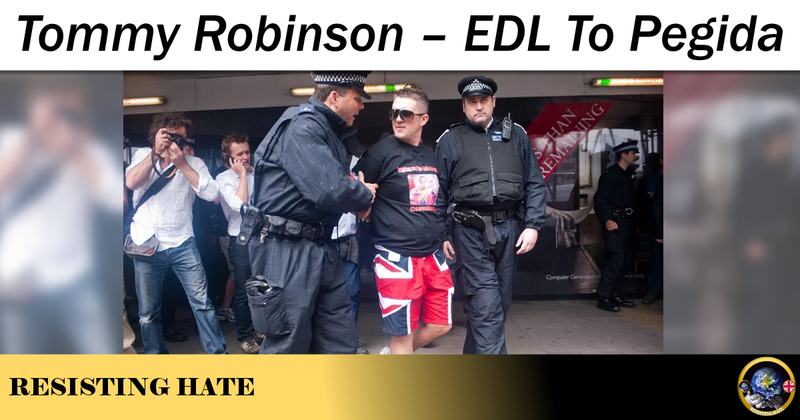 September 2011 – Robinson had been banned from attending a demonstration in Tower Hamlets yet (in his usual “Law? What law?” style) he still went to it. He was arrested and went on hunger strike as he said he was a political prisoner of the state and that the meals he had been given included halal meat. September 2011 – Robinson was convicted of assault after head butting one of his own EDL crowd during a demonstration in April 2011. For this he was given a suspended 12 week prison sentence. He claims that this had happened because a Neo-Nazi had joined their group and there was a confrontation. November 2011 – Robinson was jailed for 3 days after protesting in Zurich on the roof of FIFA headquarters. This was in response to the ruling that the English football team couldn’t wear a red remembrance poppy on their shirts for a coming game. (Obviously he didn’t get far with that one). October 2012 – After remaining out of trouble for almost a whole year Robinson was arrested after entering the USA illegally in September 2012 using another persons documentation. He was sentenced to 10 months in prison and on release in February on he was placed on a tag. After that stint in prison he was released to find that the membership had swollen but that the EDL had allowed Neo-Nazis to join up. Robinson stepped down from his position in the EDL from October 2013. He cited that he was worried about far right extremism infiltrating groups but confirmed he still would continue to fight what he saw as Islamic extremism. November 2012 – Robinson was charged with three counts of conspiracy to commit mortgage fraud. He pleaded guilty to two counts and was sent to prison for 18 months. While in Woodhill Prison, Robinson was attacked by 3 men, which he claimed to be Muslims who prison officers had intentionally left him with. Before long he was removed from Woodhill and sent to Winchester Prison instead. It was while here that he said that he made friends with some Muslim inmates and actually spoke highly of them. Some of our readers may be acquainted with The Quilliam Foundation which is a think tank who state that they are concerned about Islam and stand against “Islamism”. Quilliam believe that Islamism (or political/radical Islam) is not compatible with Islam as a religion and that a westernised version needs to be developed without any radical elements. Their about us section gives more information about what they do. Now some of the aims of The Quilliam Foundation are pretty sound. We support their views on giving Muslim women the right not only to not wear Islamic headwear but also the right TO wear it as well, including the Niqab or Burka. We also like the fact Quilliam have stood against Geert Wilders and have publicly stated that he is an ill informed, hate filled bigot and that they have challenged Wilders’ statements that Muslims are a threat to European countries and democracy. The Quilliam Foundation has also had some major criticism. They are funded by the government/tax payer and concerns have been raised about the way that they have acted with public funds. For example there have been concerns about them allegedly carrying out “witch hunts” against people who are just Muslims without any radical element. There was also concern regarding a leaked document sent from Quilliam to the government in which it wanted the government to stop communicating with groups like the Muslim Council of Britain, Muslim Safety Forum (who work with the police to improve relations within the community) and others. This gave rise to the idea in some quarters that Quilliam were saying all Muslims outside their group were a cause for concern (which is obviously not the case) and that the only non-radical elements were linked to/associated with Quilliam. After he left the EDL, Tommy Robinson forged an association with Quilliam. Both Tommy and Kevin Carroll met with the leader of The Quilliam Foundation to discuss a rise in far right extremism which was influencing groups like the EDL. In an announcement in October 2013 Tommy said he would be starting a new group to challenge radical Islam. He said that the new idea would be to lobby institutions rather than street protests. Subsequently, in December 2015, Tommy Robinson claimed that he had been paid by The Quilliam Foundation (£8,000) so that they could take credit for him leaving the EDL. Quilliam did admit to paying him however they stated that the payment was just to cover his costs. During an interview with The Guardian on the 11th October 2013, Tommy Robinson apologised for saying that all Muslims “got away with” the 7th July bombings in London. He also said that his statements about the bombings and other issues had been fuelled by the culture within the EDL, alcohol and athe rush of being the head of “the biggest street protest movement in Europe”. During The Quilliam Foundation/Robinson press conference where he announced he was leaving the EDL, Robinson confirmed that he would liaise with the police about far right racists within the EDL. He conceded that there were extremists in the EDL and likeminded groups and that he would support organisations who dealt with extremist behaviour on all fronts. He acknowledged he wouldn’t support any of he work carried out by anti-fascist groups as he believed these groups were aligned with communists and anarchists. He stated that fascists and Islamists were both sides of the same coin. Once his “good behaviour” licence had expired after being in prison Robinson joined PEGIDA. The acronym stands for Patriotic Europeans Against the Islamisation of the West (or more precisely Patriotische Europäer gegen die Islamisierung des Abendlandes). The group initially started in Dresden, Germany, and has since spread through many countries in Europe. When heading up PEGIDA UK, Robinson claimed that the time for fighting and legal issues had passed and that instead he would concentrate on legitimate protest with alcohol and fighting forbidden. The first march in the U.K. would end up being less than a roaring success so a second one was arranged in January 2016. For the launch of PEGIDA proper in the U.K, Tommy stood down as leader and became an advisor and in his place they put Paul Weston of Liberty GB and Anne Marie Waters from Sharia Watch. The official launch of PEGIDA UK was held in February 2016 and a grand total of 200 or so people turned up. When talking about PEGIDA, Robinson says that he hopes that they would succeed where the EDL and others have failed. He is looking for a halt to Islamic immigration, for all sharia courts to close, the outlawing of the burka and a halt on current construction of mosques in the U.K.
Now as some of our readers are aware I undertake a lot of undercover work for Resisting Hate and have to say that while Tommy is all loud on demonstrations, his Facebook account is terribly boring……so boring that I could read it as a sleep aid. Needless to say however, that while he is boring there is a lot that gets reported and removed as his feed is full of bigoted references like “horrible Muslims” and “creeping sharia” etc. 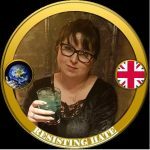 Since the PEGIDA UK launch (snigger….) Robinson was attacked in Essex and clobbered with something rather hard over the back of the head which left the poor man with a concussion and which had to be investigated in hospital . He also travelled to watch the football in France in 2016 where he wore a t-shirt mocking ISIL, and got a banning order in his return which ended up being dismissed when it went to court. In 2016, Robinson travelled to Israel and visited the border between Israel and Syria, at the Golan Heights. While he was there he was photographed standing on top of an Israeli tank which he posted on his Twitter feed with the comment “All those people telling me to be careful in Israel, I think I’ll be ok…” He went on to visit an Israeli pub, where his travelling companion “Dr Brian of London” (a blog writer) put a photo on his Twitter feed stating “This is going to make Zionism great again. Arad. 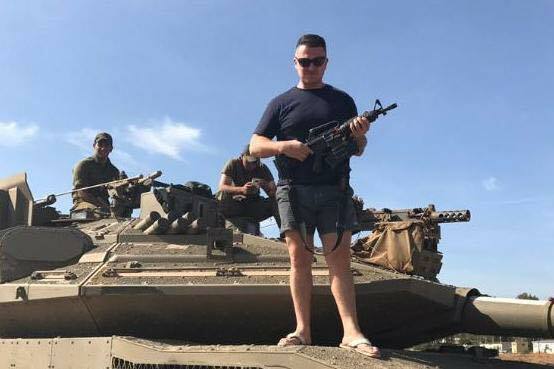 @TRobinsonNewEra is in the house of Zion.” Prior to this Robinson had publicly declared support of the Jewish people and the state of Israel, but had also been accused of being Anti Semitic. Since stating that he was leaving the “extreme right” behind, Robinson seems to have slipped back into his old ways. A photo of a member of Parliament with two individuals from the Pakistani community was Tweeted by Robinson with the claim that these men were paedophiles (which was not the case) and this drew criticism as it put the individuals concerned at personal risk. Further to this Robinson’s Twitter and Facebook history show that he is not just against radical Islam, he is aginbst Muslims per se. For example he states that the police appease Muslims and don’t take action against them as they don’t want to offend them. He also frequently shares fake news stories which paint Muslims in a bad light. I honestly doubt, based on what I have seen, that he will stop his actions. With his book being published along with his business (he owns a sunbed shop in his home town of Luton) Robinson and his hate seems to continue to flourish. 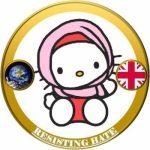 “Since the PEGIDA UK launch (snigger….) 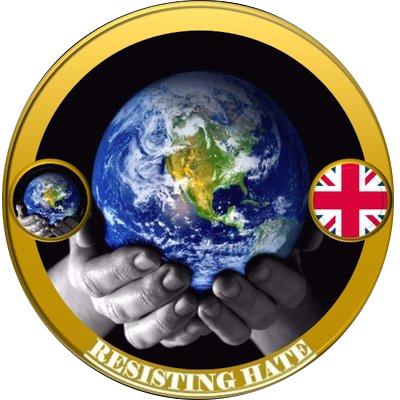 Robinson was attacked in Essex and clobbered with something rather hard over the back of the head which left the poor man with a concussion and which had to be investigated in hospital .” – Resisting hate? I wanted to like and support this blog, but couldn’t. Sorry. Poorer than usual and totally hypocritical. I think we will start approving your comments Goggins as you are our most dedicated commenter. Interesting. Don’t usually read further than the headlines featuring this gobshite. It would be interesting to note who actually funds these racist facists groups..Where do they get their literature from ? You would be suprised. I would like to think I am an average British person who’s Father and Grandfather fought in both wars, yet I would also want a halt of Muslim immigrants, a ban on Hallal Slaughter, outlawing the Burka and a definite ‘ stop’ on construction of Mosques. The reason. ?… mass immigration and ‘chain’ immigration has led to a climate where our customs, traditions, and our very culture is under threat . We have had our religious purges where we beheaded ,burned alive people who blasphemed…hundreds of years ago. We have now evolved into a secular society ,it has taken centuries to arrive at this point , now we could be plunged back to those dark days with this barbaric religion of Islam and barbaric Sharia law. You can call me racist, anti – Islamic or whatever. But never accuse me of burying my head in the sand. You seriously think that 0.1% of the population can drag us back to the days of burning people alive. Are you really claiming that to be your rational. Yes 0.1 because the vast majority of muslims are no more witch burners than your average christian. My son spent 7 years at a school where the majority were ‘non-indigenous’, oddly enough he wasn’t beheaded even once, not only that many of his friends come from muslim families probably because their thoughts, behavior and demeanor appear to be almost as secular as his. My experience was quite different. I spoke out against collective punishment of the Palestinians in 2014. When this came up in a discussion I had on Facebook during the migrant crisis, where my view was that we should not simply open the floodgates to thousands of undocumented people, I was told that my loyalties were confused and that this person hoped I would get my head cut-off first, presumably when some form of Jihad was to take place – nice. We’d had a discussion beforehand where the person seemed quite reasonable but I guess I was mistaken. Sure it’s just my experience but you’ve just detailed your son’s experience, so I’d say that was fair. This is promoting hate in it’s self. I have met Tommy Robinson multiple times and this really does paint him in the wrong light. He’s a family man and a true British Patriot. Mass immigration is a problem and he’s the only one that seems to speak out about it. He’s a racist and a bigot who is hellbent on manipulating his gullible fanbase into hating Muslims. The man belongs behind bars. Boring lies and propaganda. But dont let the truth get in the way of your hate. The irony is you complain he is hateful by creating a work of fiction to propagate hate. All rather sad.